A few weeks ago I teamed up with my friend Isabel in the kitchen to make a few healthy snacks together. 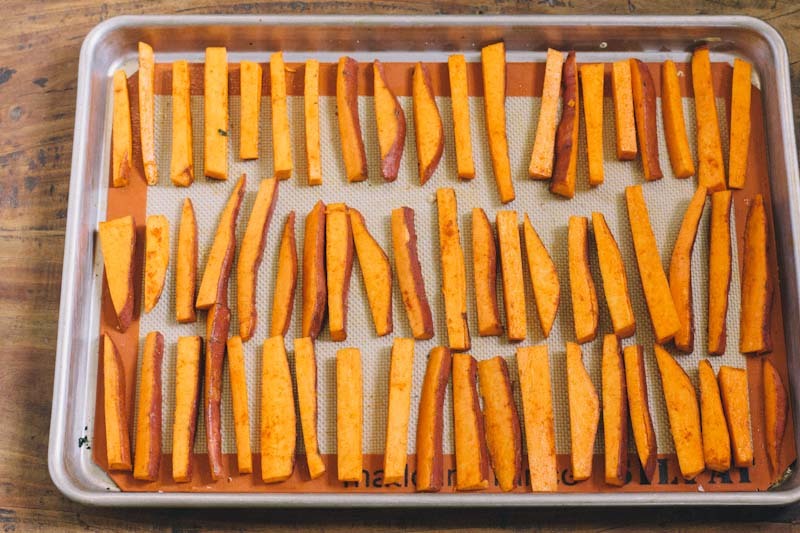 We made kale chips and these tasty sweet potato fries. After making the recipes, I decided I would be making both more often. The two snacks can be made with exactly the same spices and take little to no effort to make. Plus they are delicious!! I love meeting someone new and then being inspired by them in some way. 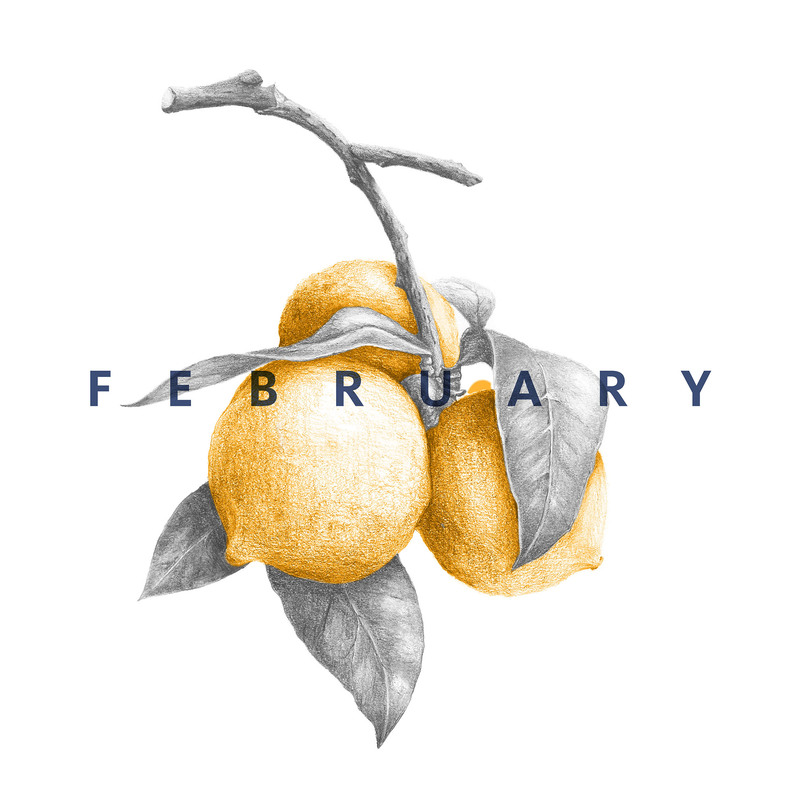 Whether that inspiration comes in the form of a new book to read, tv series to watch, recipe to make, or life change to make. Isabel is that type of lady. Not one that forces change on anyone but someone who gently encourages and inspires. 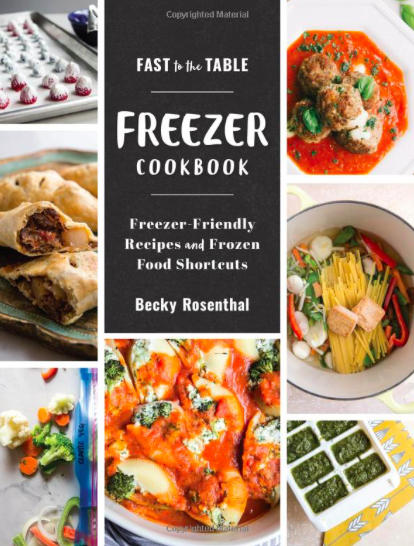 She naturally makes you want to eat better, just because what she’s making tastes so good! As, we cooked we had a little helper (or beggar) alongside, which you can see peeking into the photo above. 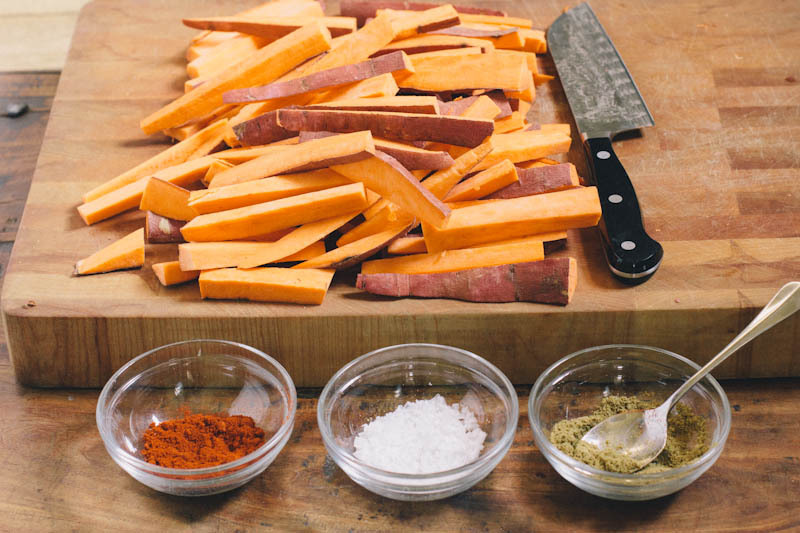 For this recipe we left the skins of the sweet potatoes on, adding extra vitamin C and fiber to the fries. You can also add or subtract spices to your preference. If you like a spicier taste, add more paprika. I find these fries a perfect entry for those wanting to eat healthier but timid at the idea. 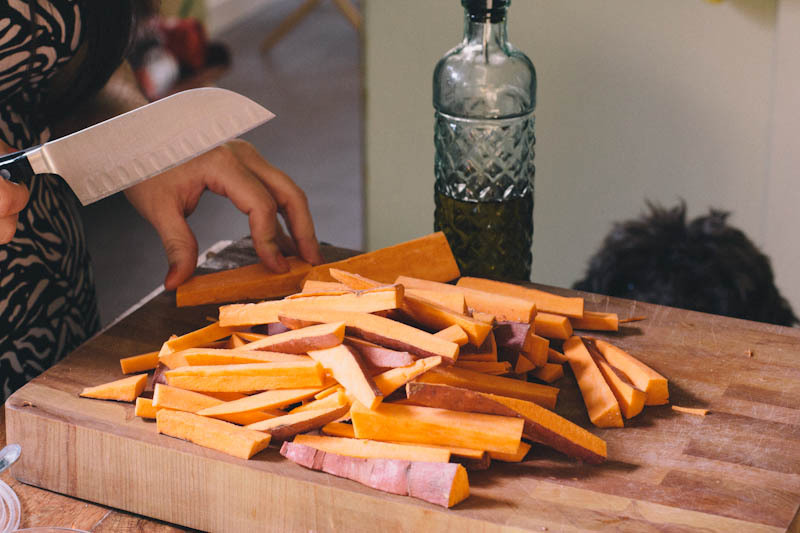 You can find our recipe for kale chips here, but today I’m sharing our recipe for sweet potato fries. What or who is inspiring you in the kitchen these days? 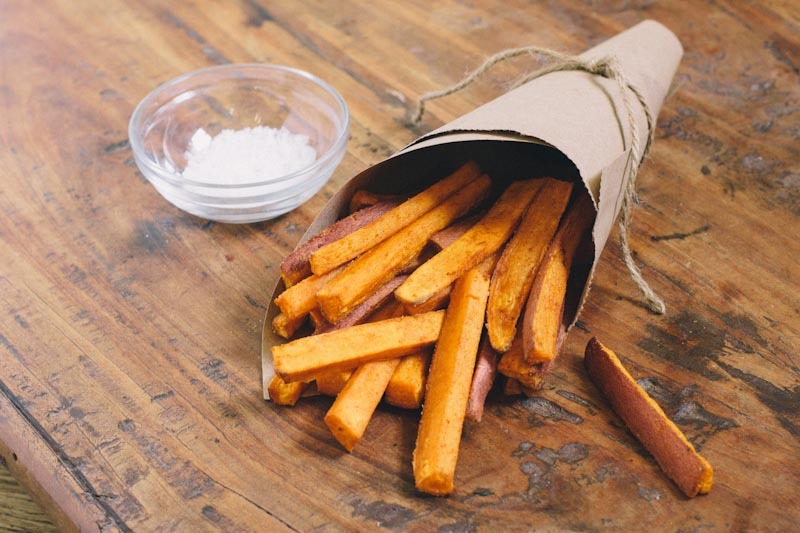 A simple recipe for homemade sweet potato fries. Preheat the oven to 450 degrees. Slice the sweet potatoes into long strands, not too thin, but try to make them similar in size and shape so they will cook evenly and at the same rate. Toss fries with spices and oil, using your hands to combine them well. Lay them out in a single flat layer on a cookie sheet or two. Bake for about 16 minutes, flipping after 8 minutes. Fries should be slightly crisp and starting to brown. I have been on a huge cumin kick lately – I can’t get enough of the smokiness! These sound soo good, and I love that they’re thick-cut! I feel like most things I make have cumin in it lately also!! Must be the Texas in us! Oh, these look positively scrumptious and I’m pretty certain that I couldn’t stop at just one (or 20). I’m so glad to have found Isabel’s blog from your post! 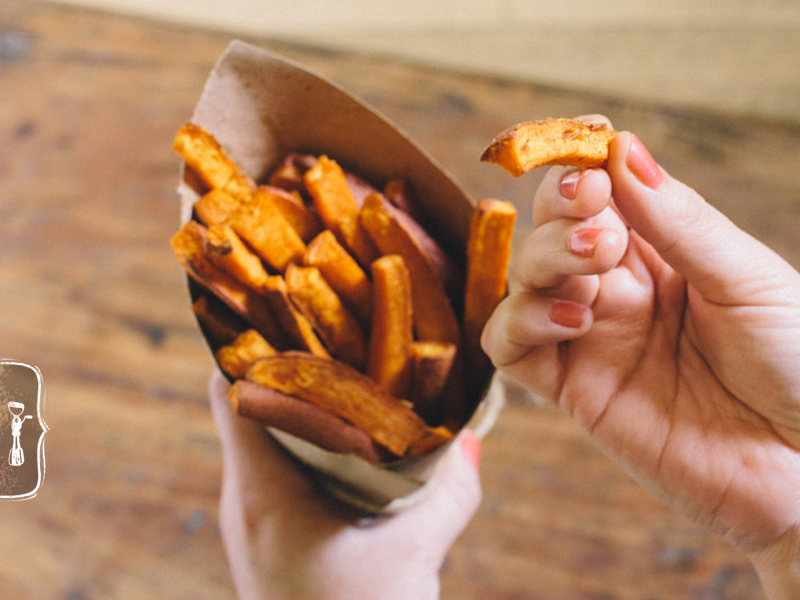 Sweet potato fries are my weakness! Can’t wait to give these a try. Love baked sweet potato fries! Such a yummy and healthy side dish. Thank you for the kind words my friend! I’m always inspired by people who just love food- whether it’s through food photography, dinner hosting, health promotion or anyone licking their fingers after a good bite! Thanks for your inspirational blog! I always admire your pictures. Love how Henry pops up in so many of our raw pics. Haha! He sure knows how to pick good food! Lucky for him he’s got you! For people who enjoy sweet potatoes, this could be a good recipe for them to try. Thanks for sharing this article.